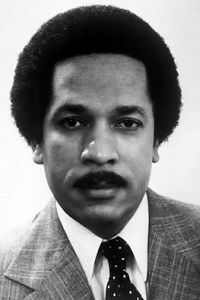 Max Robinson was an American broadcast journalist for ABC News and served as a co-anchor for ABC World News Tonight. He was the first African American broadcast network news anchor in the history of American television. He was also one of the original founders of the National Association of Black Journalists. Robinson was born on May 1, 1939 in Richmond, Virginia to Maxie and Doris Robinson. A talented student, he later attended Oberlin College where he served as president of the freshmen class. He later attended Indiana University and eventually earned his degree from Virginia Union University. Robinson served in the Air Force and eventually received an honorable discharge due to a medical condition. Robinson began his television journey in Portsmouth, Virginia in 1959 where he applied for a position at a local radio station that had a “white’s only” policy which at the time was legal. Nonetheless, the station owner allowed Robinson to audition for a position along with several white candidates. Robinson was given a job reading the news on the air, although he was told that his face could not be seen. When Robinson protested, he was fired. Afterwards he moved to Washington, D.C. and worked at WTOP-TV as a cameraman trainee and in other behind the scene jobs. Robinson found a job at Washington’s WRC-TV in 1967, remaining there until 1978. While there he won six journalism awards for his coverage of civil rights events of the era including the 1968 assassination of Dr. Martin Luther King, Jr. By the end of the decade, Robinson was one of the most popular news anchors in the nation’s capital. In 1978, Robinson was selected by ABC executive Roone Arledge to become the co-anchor of ABC News. He served in this capacity until 1983. Despite his success, Robinson was sensitive to racism and its negative impact on him and other black journalists. During his time at ABC Robinson clashed with the management of ABC News over what he (Robinson) saw as the one dimensional, often negative, portrayal of black Americans. He was also known for his erratic behavior, frequently failing to report to work. By 1981 Robinson had developed a dependency on alcohol and was diagnosed for depression. His career suffered. By 1985, he was reduced to anchoring the weekend news and news briefs in Chicago. In the fall of 1988 while delivering a speech at Howard University School of Communications Robinson became alarmingly ill. He checked himself into the university hospital where he remained for months. He died on December 20, 1988 from complications due to AIDS. While speculation surrounded his sexuality in the weeks and months following his death, during his life Robinson denied being gay or bisexual. Robinson was married several times. He had three children from his first marriage, Mark, Maureen, and Michael. He was also the father to another son, Malik, from his second marriage. His third marriage was to Beverly Hamilton. Rev. Jesse Jackson gave the eulogy at Robinson’s funeral service. Barbara Matusow, The Evening Stars [/] The Making of the Network News Anchor (Houghton Mifflin Company, 1983); Robert Cooper, Television’s Pirates: Hiding Behind Your Picture Tube (Mangonui, Far North New Zealand: Far North Cable Vision, Ltd, 2006); Aaron Freeman “The Last Days of Max Robinson,” Chicago Magazine, June 1990. Max Robinson,” Chicago Magazine, June 1990.